I find 47 Labs to be such an interesting company. At times I am tempted to get rid of all my ultra expensive and big gear and just listen to one of their little systems, as they are so musically satisfying. While I have always considered myself to be in KISS (KeepItSimpleStupid) high-end audio camp, the 47 Labs approach takes this to a whole new level. After this review I plan to hook up a complete 47 Labs Midnight Blues System using these speakers and even their cables. That’s for another review though. I just got back from the 2014 California Audio Show which had many rooms of really expensive High Resolution and DSD Dacs and I didn’t hear a single one that made we want to part with the little 47 Labs Midnight Blue CD Player. I know I’m not much into digital, but at least I find the Midnight Blue player fun to listen to. The new Lens II speakers are basically the same speaker the 47 Labs has been making for years, but with the addition of a newly developed driver that uses an Alnico magnet. To me there is something magical about Alnico magnets whether they are in speakers or phono cartridges. In my smaller system I use Teresonic Magus A55s. I listened to the Magus with drivers with three different magnets. To me, the A55 with its alnico magnet was clearly the most beautiful sounding of the Magus line. So, I have been looking forward to listening to the new Alnico version of the 47 Labs Lens. With the Lens II we have a three inch (specs say a 10cm) single driver bass-reflex speaker in a cabinet smaller than some shoe boxes. They came double boxed and packed very well. The review pair was black and looked very nice, especially with the grills removed. I tried them on two different speaker stands but ended up with them on a pair of Sound Anchor sand/lead filled 28 inch stands. I found they sounded best off the back and side walls. I also tried them with different amps; I did not care for them as much with tube amps as with good transistor amps. I thought they were a bit on the warm side with tubes. I liked them best with the 47 Labs amp and especially with the Pass Labs 30.8 amp. They work best in small rooms. They struggle to fill my 20’ by 15’ foot room, which is open to the rest of the house. They sounded great in my office which is 12’ by 10’. When you look at the specs there are a couple of things that remind me of Quad 57s. First, like the Quad 57s you aren’t supposes to use too much power. 47 Labs says to limit the power to 25W continuous and 40W peak. Second, they aren’t very efficient, 85dB to be exact. Unlike the Quad 57s they are a 4 ohm load. The result for both speakers is that you can’t push them too hard. Again, unlike the Quad 57s you don’t have a large area radiating the sound, but a small single driver. The result is a speaker that can’t play really loud. With the 47 Labs Midnight Blue amp the Lens play beautifully at low to medium loud levels. In the smaller room they played all the way up to what I would call loud. When using the Pass Labs 30.8 they sounded much bigger and more powerful. With either of these good transistor amps they never sounded dull or bright, that’s not an easy see-saw to balance. The bass of these little speakers really surprised me. No, they don’t go deep, but the bass they have is surprisingly engaging. They had nice tone in the lower midrange and upper bass. They also had a nice sense of air in this same area. I have heard several five inch single driver speakers that didn’t play bass as well as the Lens II. At the same time they don’t play nearly as deep as the Teresonic Magus, but then they cost over $4,000 less. The Lens II played voices very nicely and convincingly. Voices sounded natural and that was equally true for female and male vocals. I point this out because so many small speakers add too much warmth to male voices, because of their mid bass hump. Voices are not quite as articulate, quite as transparent or alive sounding as the Teresonic Magus speakers, but that does not make the Lens II any less good. Trumpets, saxophones, and clarinets all had nice tonality and were very enjoyable. The Lens II has the characteristic wonderful tonality of alnico magnets. In other words they play music with great tone and soul and are never bright or edgy sounding. With horns and woodwinds they are on the side of warmth and may not have the very last word in bite. Still, the sound was nicely alive and communicated the music in a very enjoyable manner. They don’t quite pass my treble test, that is the treble doesn’t call any attention to itself; you don’t notice it as good or lacking. As surprisingly good as the bass was for a small, single driver speaker the top end doesn’t seem to have the air and sparkle I had expected, though with the Pass Lab 30.8 this was less apparent. It would be wrong to talk about any little speaker and not talk about their soundstaging abilities. The Lens II are as good as it gets in this area. Set up right the soundstage extends way beyond the speakers and the soundstage appears totally behind the speakers and very deep. It’s that kind of soundstage where non-audiophiles want to know where are the speakers that are playing or are the speakers firing out the back. The good thing about the Lens II is they manage to do this and still have a very coherent soundstage. You can hear the air between the instruments and the space the recording was made in. The speaker I have had in house lately that is closest in size to the Lens II was the Audience “The ONE” speakers. Thought they are slightly smaller, have less internal volume and while it uses a three inch single driver it also has a rear firing three inch passive driver. “The ONE” also cost 1/3 what the Lens II cost. The other speaker I had on hand at the same time was the Audio Noe K/SPe. Their cost is similar to or a little more expensive depending on finish. 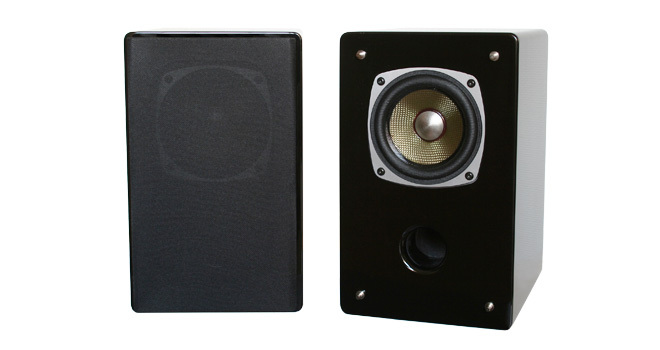 The K/SPe is a very different speaker; it is a two way, it is more expensive and quite a bit larger. The interesting thing is the sound of the Lens II falls somewhere in between the sound of these two speakers. Neither the Lens II or the Audience speaker will play nearly as loud as the Audio Note. The Audio Note is very much at home with an SET amp and neither of the other two sound their best with SETs. Both the Lens II and the Audience produce a more holographic, reach out and touch you soundstage than the Audio Notes, though personally I prefer the textured and layered soundstage of the Audio Notes, but I expect most audiophile will prefer the other speakers when it comes to sound stage. The Audience is the more transparent of the three speakers, and like the Lens II excels at totally disappearing. All three speakers have good bass, but I personally love the punchy fast bass of the sealed cabinets of the Audio Note Ks. The Lens II has much bigger bass than the Audience but not as big as the Audio Notes. All three of these speakers are very good but which is best will depend on what you are looking for. Sorry I am in Europe. Use Tannoy Glennair driven by Simaudio I5 Limited edition. Will not change. 47 Labs just sticks around on the periphery of the audio circus seemingly daring us to be courageous enough to not buy the hype of the mainstream. Your interest in them given your position in the online review community inspires me to ask you if you would consider at some point reviewing the 47 Labs Reference level comparing it to what is your understanding in 2015 of sota.. We’re talking Gaincard, Flatfish, Progression/Gemini etc. Back when these were new they created quite a stir. As you know your editor spent a lot of time back then with this equipment. Two other reviewers said something along the lines of the Gaincard having a similar vibe as the Ongaku. I think a lot of people would appreciate a fresh look at the 47 Labs Ref line. Surely Yoshi would be happy to cooperate. Srajan kind of burned him once comparing the Gaincard to the various gainclones, the price being the largest problem. Here in 2015 the prices of the 47 Labs kit doesn’t seem so outrageous. 47 Labs Lens II Speaker are very similar to the Air Tight Bonsai AL-05 Mini-Monitor! Can you comment on this please? Their developer is mister Ohmura-AMM Sound Lab.